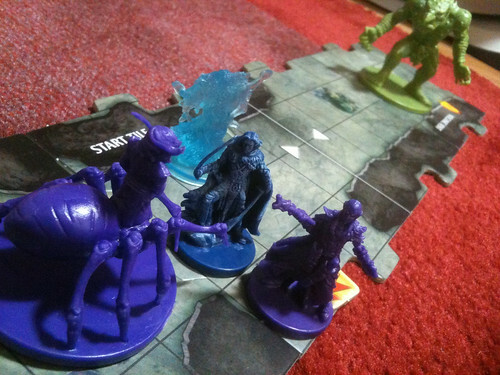 The Legend of Drizzt is turning out to be a very solid contender in Wizards of the Coast’s D&D boardgame series. In terms of punch for your buck, it may pack the best, with 8 heroes, some 4XP monsters that in other games were limited to special convention promos, animal allies, and more variety in basic map features (volcanic vents and narrow passages that affect defense, a starting map tile that expands in all directions). Legend of Drizzt has the learnings from Wrath of Ashardalon and the thematic strength of Castle Ravenloft. The first adventure is, as always, a solo experience to let you get the hang of the ropes of surviving in the Underdark. (Or the Castle, or the maze of mountain tunnels.) 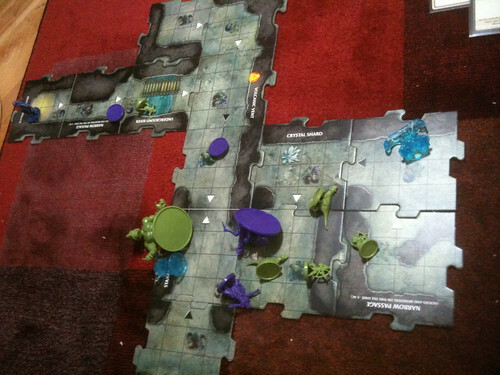 You’re playing Drizzt, Drow Ranger, and the objective is to escape to the surface after going through caverns filled with goblins, driders, and teleporting wizards that spout fireballs. Man is Drizzt’s special ability cool: an extra attack each Hero Phase. Does this mean he’s overpowered? Perhaps a tad, although I still died a horrible death the first time I ran through the scenario—you only get one healing surge. But I’m guessing that’s why he only gets a +6 bonus from Icingdeath and Twinkle (his two swords are represented as At-Will power cards), and also why the enemies in this game are… well… a bit tougher at times. Guess which monsters are 4XP? The second card to use the stance mechanic is Dancing Serpent, which lets you move a vital few squares after an attack to get out of range of certain attacks. ((See also The Fine Art of Kiting in Wrath of Ashardalon to get an idea of how just two squares can give you a huge advantage in certain situations.)) Significantly, it’s a Utility power that doesn’t flip over (usually ensuring a single time use for most Utility and Daily powers), but does only operate as long as you have a stance reserved for it. Treasure cards are a mixture of Fortunes and Items. Items are generally not as cool as the loot you get from Asharadlon’s lair, but the Fortunes are quite more handy and applicable than those from Castle Ravenloft (which more often than not would go to waste). The mixture of Items and Fortunes means you won’t be carrying more items than power cards as the game wears on, unlike the beginning half of WoA’s adventures. There’s no need to resort to treasure tokens here. What Icingdeath and Twinkle can do when Drizzt draws some Bolsters. Monster cards have a few exciting additions, with the 4XP monsters (gods help you if the Feral Trolls both come out at once) and “Hunting Party”, which pulls out two monsters to play. There’s also two “It’s just a looming stalagmite” cards which allow you to get away with no monsters being placed on a new tile or via encounter card. Speaking of encounter cards, the deck is meaner than WoA’s, perhaps as mean as CR’s: plenty of red attack cards, and the traps are evil. You do not want to draw any of these, and if you do, you’ll want to use experience from killing monsters to cancel these mofos. They’re probably another compensation for the wicked awesome coolness of the heroes. 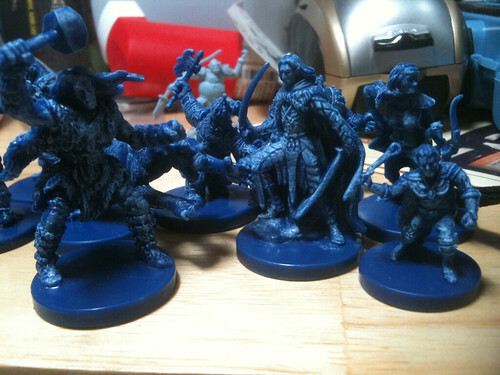 I fear for the more normal adventurers from WoA and CR should they be thrown into the world of Drizzt. They’ll be troll chow. 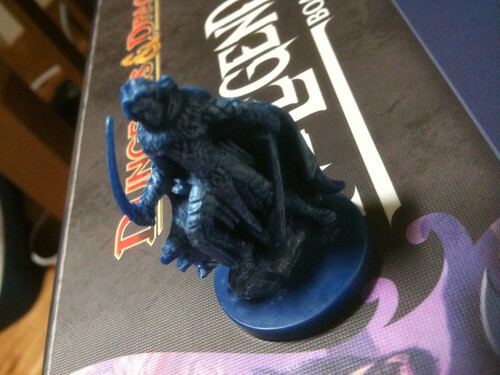 Who’s the baddest Drow in the Forgotten Realms? While the heroes do appear to be stronger in Drizzt, for group adventures I would suggest that for two player games you still play with four heroes, while solo games would benefit from three heroes. We’ll see how that works out in the next adventure, “Search for Mithral Hall”.